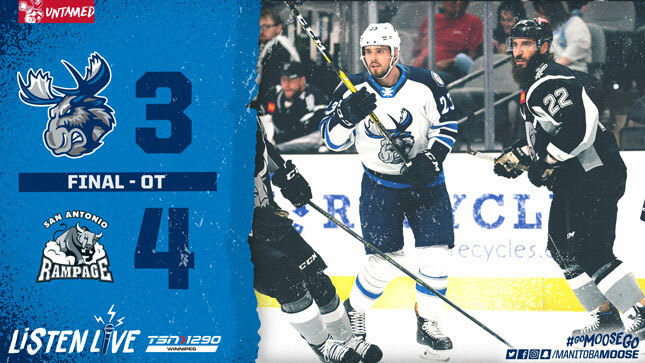 The Manitoba Moose (34-28-5-2) fell 4-3 in overtime to the San Antonio Rampage (28-35-6-1) on Saturday evening at AT&T Center. After surrendering the opening goal on Friday, the Moose made sure they got out to an early lead. Ryan White sent Hunter Fejes in behind the San Antonio defence, and Fejes was able to beat Evan Fitzpatrick with a move to open the scoring at 5:28. Moose goaltender Mikhail Berdin did his part in the period, stopping eight San Antonio shots as Manitoba took a 1-0 lead to the break. The Rampage got on even footing with the Moose seven minutes into the second frame. With the Moose killing time off a penalty up ice, a giveaway turned into a two-on-one the other way and Ryan Olsen finished off the play. San Antonio took the lead 3:28 later as the Rampage caught the Moose in a change and Tyler Wotherspoon was able to cruise up the slot and fire a shot to the back of the net. Fitzpatrick made 12 saves in the period for the Rampage as the home side carried a 2-1 lead into the final stanza. The Moose tied the game just 1:47 into the third when Felix Girard ripped a shot that redirected into the San Antonio net off a defender. The score stayed locked 2-2 until Seth Griffith scored a power play goal to move Manitoba into the lead. Marko Dano put a slick feed onto Griffith’s tape in the slot and the veteran delayed before snapping a shot off the post which ricocheted back into the goal off Fitzpatrick’s skate. The Moose couldn’t hold onto the lead as Klim Kostin ripped a one-timer past Berdin to tie the game with the extra attacker out and 1:08 left on the clock. Overtime saw the Rampage come away the victors when Jake Walman scored with a minute left in the extra frame to snap a 10-game losing streak for San Antonio. JC Lipon tallied an assist playing in his 400th career professional game (391 AHL, 9 NHL). Felix Girard scored a goal playing in his 350th AHL contest. Ryan White has three points (2G, 1A) in his last two games. The Moose return home for a crucial four-game homestand hosting the Bakersfield Condors and Stockton Heat. 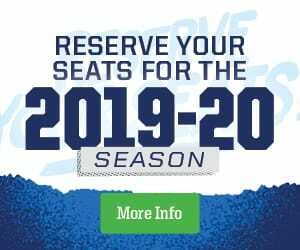 The stint at Bell MTS Place begins Tuesday against Bakersfield in a 7 p.m. contest. Tickets for all four games next week are available at moosehockey.com/tickets.